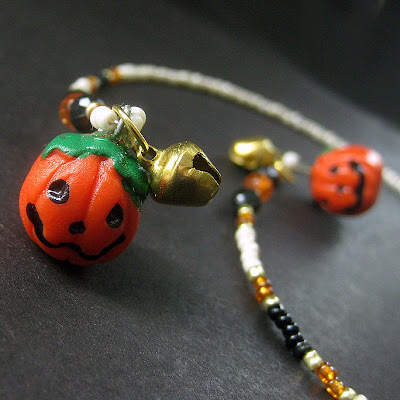 When I found these little Jack O'Lantern charms, I had to buy them. They were just so fun and they inspired me to make a Halloween Series of Bookmarks! I love Halloween. I'm rejuvenated by the change in weather and that seems to touch every aspect of my life. I feel more inspired and it shows in my designs and in my home as well. In this 16.75" (42.5 cm) bookmark, a plump orange Jack O'Lantern with golden bell accent dangles at either end of this Halloween-themed fully-beaded bookmark that's perfect for celebrating the season and is sure to mark your place with your own personal style without damaging book's pages by the commonly used corner-folding methods.